State Street at railroad tracks, looking north. Note Davidson's Drugs north of Oswego lumber. Attached caption: ""Raising a 75 ft. pole for electrification of P.S. & E railroad, Dec. 1913."" [stamp]: Mrs. Robert Arneson, North Shore Road, Oswego, Oregon. Transcription State Street at railroad tracks, looking north. Note Davidson's Drugs north of Oswego lumber. 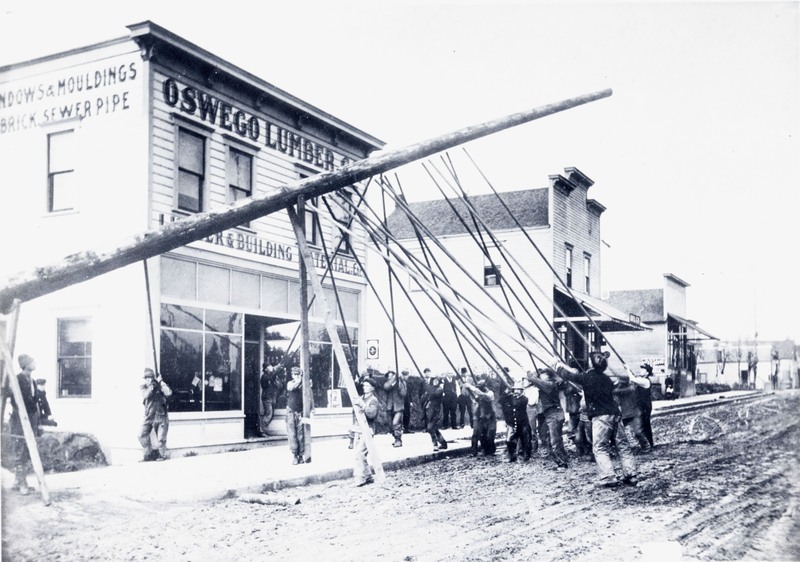 Attached caption: ""Raising a 75 ft. pole for electrification of P.S. & E railroad, Dec. 1913."" [stamp]: Mrs. Robert Arneson, North Shore Road, Oswego, Oregon.